The first thing you need to know about Wandering Boar Farm is this: We haven’t had time to write a “FAQ” page. We have a FAQ link because everyone else does. Unlike everyone else, however, we don’t have time (yet) to write the FAQs & the Answers. We are currently selling shares and 1/2 shares in both pigs and sheep. If there is one thing you need to know about Wandering Board Farm, it is this: we treat our animals well. 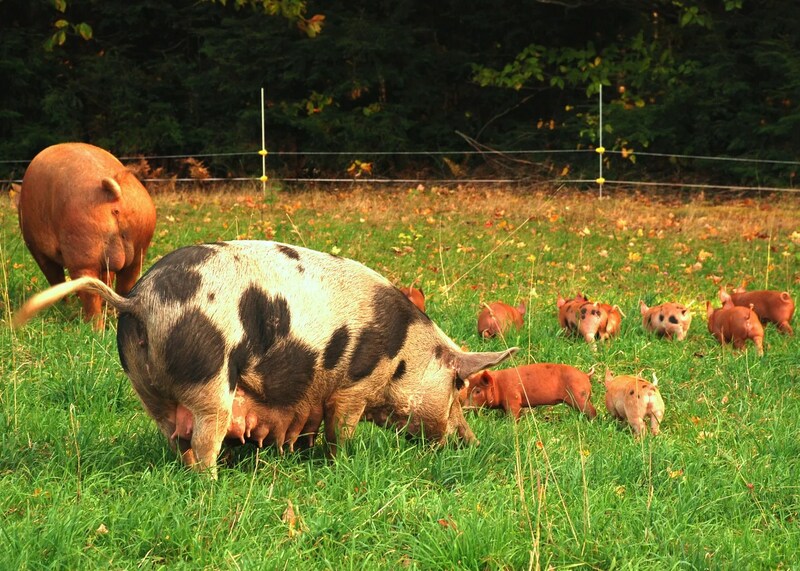 We give them plenty of pasture (and woods for the pigs) to graze, nest, breed and play. We never place them in stalls or a barn. They choose where to sleep and pick their own bedtime. Boar, sow and a litter enjoy fall grazing before moving to a winter paddock in nearby woods. More content is coming and you will probably find an answer to most of your questions just browsing this site. Enjoy!